Overcoming Movement Disorder: Whose child is this? I usually let Victoria decide what to wear and today, for her first full day of school, was no different. Victoria picked out a PINK dress and PINK (not quite matching) headband. 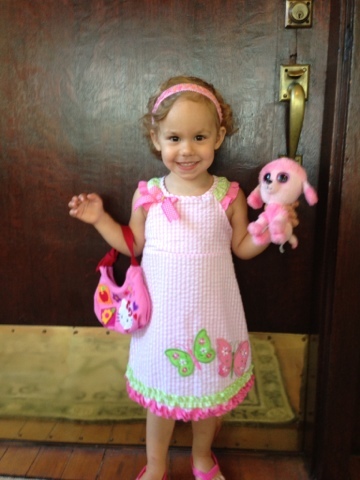 She also *insisted* on wearing PINK shoes, and on bringing a PINK purse and her PINK doggie to school. How is this my child? Oh my. Oh mama, your little lady would so get along with my Sammie. Total fashionistas. On the weekends, if I'm not putting a dress on Sam, I do NOT DARE put one on Mia or myself because otherwise, that starts a "but I really, really, really wanted to wear a dress" debate. We've got to bring Veronica up there sometime to witness the ultimate Pink Collision (oh, wait -- Veronica's purse is PURPLE. Totally different!) My hypothesis is that it's right around this age that children really begin to realize that they are, in fact, male or female, and will go overboard trying to Be A Girl or Be A Boy. Then a few years later they calm down and something in their brains realizes that they'll still be female even if they wear neutral colours :). Oh, and Bertrand sitting up -- excellent! I wouldn't even recognize him from a few years ago if I didn't know. Oh Mommy, how cute! But, you bought them, right? Nope. Dress, headband, purse, and dog were all from my mom at different occasions. I bought the pink flip-flops but only because she needed water shoes and she demanded PINK! Girlie, girlie, girlie, girl through and through! :D So sweet.